Yankee Modern features ten elegant houses in Rhode Island and Connecticut that are moderate in scale and budget yet quietly large in ambition. For Estes/Twombly, each building site, whether responding to a view, a neighbor, or the terrain, requires a unique solution. Through careful integration of site and design, the architects create enough natural heat and ventilation to defy the rugged New England climate and extend the warm seasons. 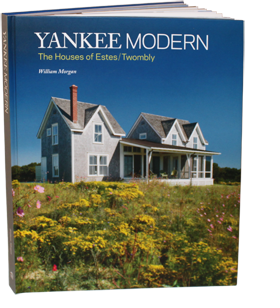 Sumptuous photography, charming drawings, and detailed plans fully illustrate Estes/Twombly’s commonsense design solutions. Author William Morgan’s opening essay traces the firm’s development and situates their work in both regional and historical contexts. William Morgan is an architectural historian and a photographer based in Providence and the author of The Cape Cod Cottage. Yankee Modern is a welcome return to the simple pleasures of modest, innovative architecture, sensitive to its site and clients’ needs.